Tohpati is one of most exciting guitarists to emerge from Indonesia, and for his third release on the MoonJune Record label, (following 2010's "Ethnomission, "Save The Planet", and 2012's "Bertiga", and "Riot", Tohpati is joined by two other renowned maestros; bassist Jimmy Haslip and drummer Chad Wackerman who appeared together on the Allan Holdsworth- Alan Pasqua "Blues For Tony" project. The result is an album of "brilliantly conceived and executed music, evidenced by a wellspring of inspired interplay, a delightful chemistry and bursts of intense, spontaneous genius." 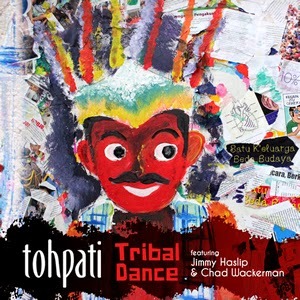 "On Tribal Dance, there's no shortage of Tohpati's trademark breathtaking, acrobatic axe-wielding. Towering power chords, distorted spare-note lead lines, unexpected machine gun-blasting sonic assaults, chugging rhythmic grooves, and even a host of elegantly-nuanced jazz phrasings, are all in attendance -- summoned at will, and in omnipotent fashion.His explosive fretwork often appears as the musical equivalent of a cobra, coiled and ready to strike, yet it is his intuitive, prescient interplay with this formidable world-class rhythm section that emerges victorious on this stage. A powerful synergy prevails, as Tohpati locks in with Haslip’s dubmaster basslines and the rubber-limbed, imaginative kitwork of Wackerman. The trio generate wave upon wave of infectious syncopations and robust grooves, gloriously decorating a very special session. Topati's Wikipedia bio recounts his interest in becoming a musician as a youngster, and "often played on many shows around Jakarta, although it was not as a professional career. As a result of his effort, he had won the title "Best Guitarist" at a band festival in Jakarta when he was 14 years old. Four years after that, in 1989, he won another notable award of the best guitarist in Java, also was given at a band festival. This award then contributed a major part in Tohpati's music experience as his name began to be noticed because in the same year, he won the another best guitarist title at a "Yamaha Band Explosion" show, which was a national show. After winning a series of awards, Tohpati decided to begin his professional career. His professional career began in 1993 when he joined a band called Simak Dialog with Riza Arshad, Arie Ayunir and Indro. Indro is a bassist who played the "Bass Heroes" show in Jakarta. Later, Indro often played with Tohpati in many different shows. With Simak Dialog, Tohpati had released 3 albums, which were "Lukisan", "Bauk" and "Trance/Madison". In the late 1990s, Tohpati decided to start a solo career and released his first solo album in 1998. The album also included a collaboration with Shakila and Glenn Fredly, both pop singers. Gaining more popularity, he released two video clips of one of his songs on the album, the song titled "Lukisan Pagi", in a collaboration with Shakila. The video clip was a success and the song made the charts in Indonesia. His second album, "Serampang Samba" offered more instrumental hits. Quite different with the last album, Tohpati only included one song with vocals on the album, titled "Jejak Langkah Yang Kau Tinggal". This was also the only song with a video clip. Serampang Samba also consists of more traditional Indonesian music with more acoustic guitars and Balinese elements. It's been said that this album was considered more idealist and progressive compared to his previous album. In 2007, Tohpati signed with the New York based progressive/fusion label Moonjune Records and released internationally three albums so far, namely "Patahan" (live), "Demi Masa" and "The 6th Story". Tohpati also released two albums on Moonjune as a bandleader. Tohpati Ethnomission's Save The Planet is his yet further exploration of the experimental jazz fusion, while his power trio Tohpati Bertiga mixes that with a touch of progressive metal."